Happy Valentine's Day! 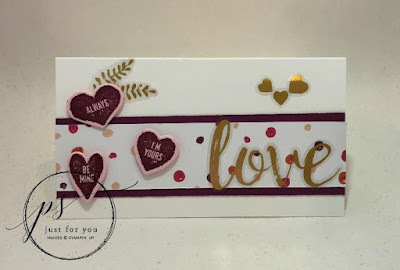 I've got a beautiful tutorial to share with you today, perfect for last minute gifts and cards for the special Valentines in your life! 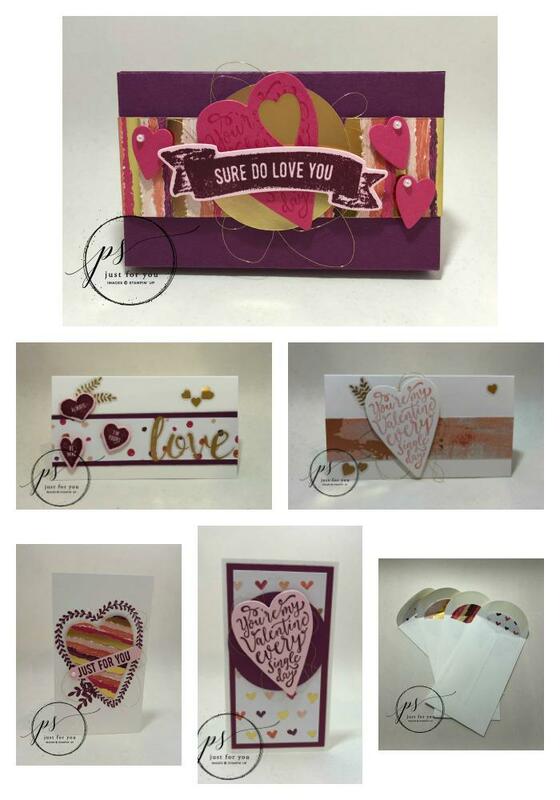 The Note Cards and Gift Box was created by Michelle Hornback for our Leaders Project Sheet Group. Using the Lots to Love Box Framelits, cut two (2) box pieces from Rich Razzleberry. Add Tear and Tape or Fast Fuse to the long tabs. Assemble box. Make sure the rounded ends are opposite each other. Wrap DSP around box and adhere to itself. This is a belly band you want to be able to remove. Make sure the end pieces meet in the front as they will be covered. Punch a circle from the gold foil. Add adhesive to the back and add gold thread to the back with loops appearing from behind. Add dimensionals and adhere to the belly band. 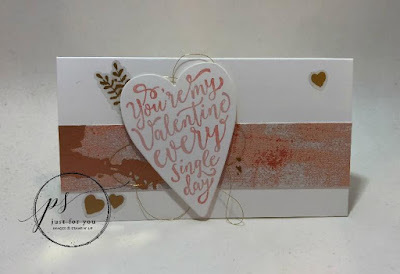 Stamp the valentine sentiment heart with Melon Mambo ink on Melon Mambo. Cut out using the framelit. Cut a small heart from the right up side of the heart using the elongated small heart. Cut two (2) more small hearts from Melon Mambo using the same framelit. 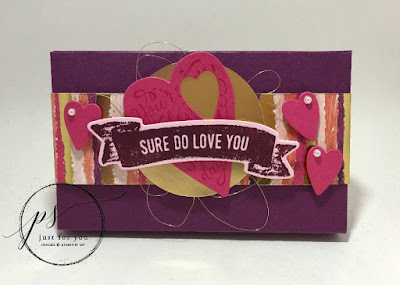 Stamp “sure do love you” in Rich Razzleberry ink on Powder Pink. Cut out with matching framelit. Adhere to large heart with dimensionals. Adhere small hearts with dimensionals. Add small pearls to the hearts. Stamp heart outline with Rich Razzleberry ink on notecard. Stamp leaves with Rich Razzleberry ink on notecard. 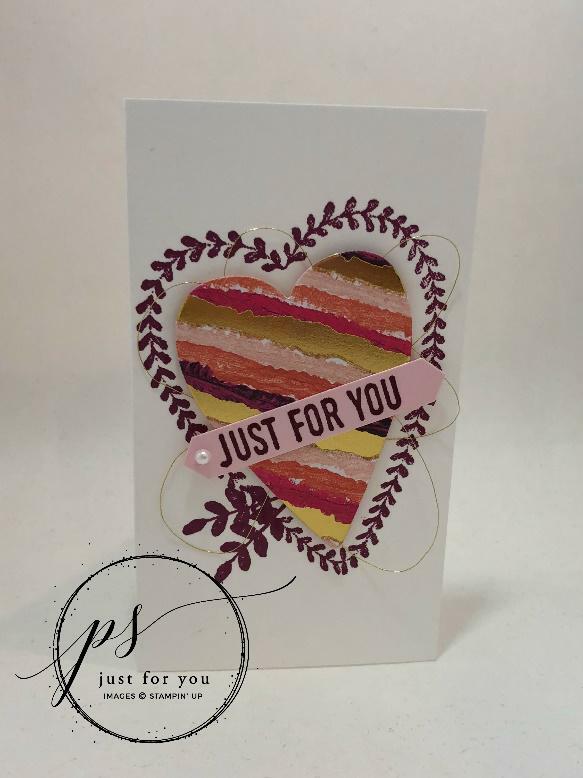 Stamp “just for you” with Rich Razzleberry ink on Powder Pink. Punch with Classic Label Punch. Cut large heart from DSP. 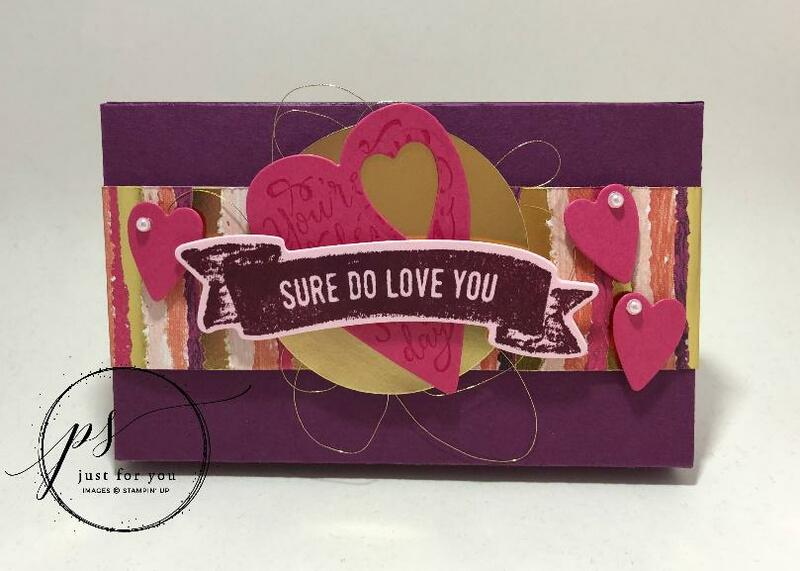 Add adhesive to center of the stamped heart. Loop Gold Thread over the adhesive. Adhere heart to card using dimensionals. Punch 2¼” circle from DSP and adhere to inside of envelope. Layer & adhere Rich Razzleberry and DSP onto notecard. Punch circle from Rich Razzleberry and adhere to card. Add adhesive to center of circle. 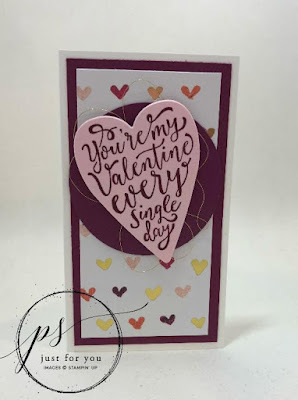 Stamp “valentine” heart with Rich Razzleberry ink on Powder Pink. Adhere Rich Razzleberry and DSP to notecard. Stamp small hearts with Rich Razzleberry on Powder Pink. Add Gold Vinyl leaf, hearts, and “love” stickers to the card. Adhere DSP (dots side down) onto notecard. Ink “valentine” heart with Powder Pink ink. Using the sponge dauber, add Calypso Coral ink in random places. Add adhesive to center of heart. Add Gold Vinyl leaf and heart stickers. 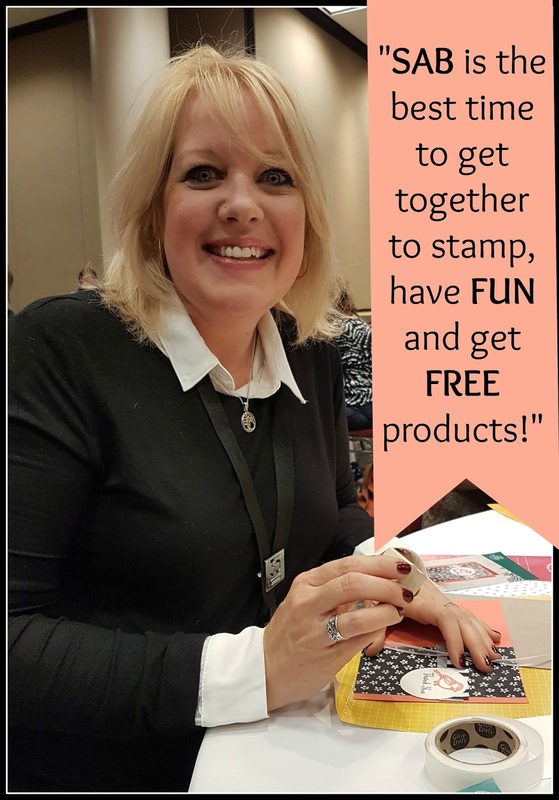 If you want to save even more during Sale-a-bration, click here to check out my "Gotta Have it All!" Starter Kit, along with all the extra perks and benefits that go along with it! If you have a big wish list of Stampin' Up! items that you want to get, I encourage you to get the Starter Kit. There are no strings attached and no risk - just a whole LOT of products at approx. 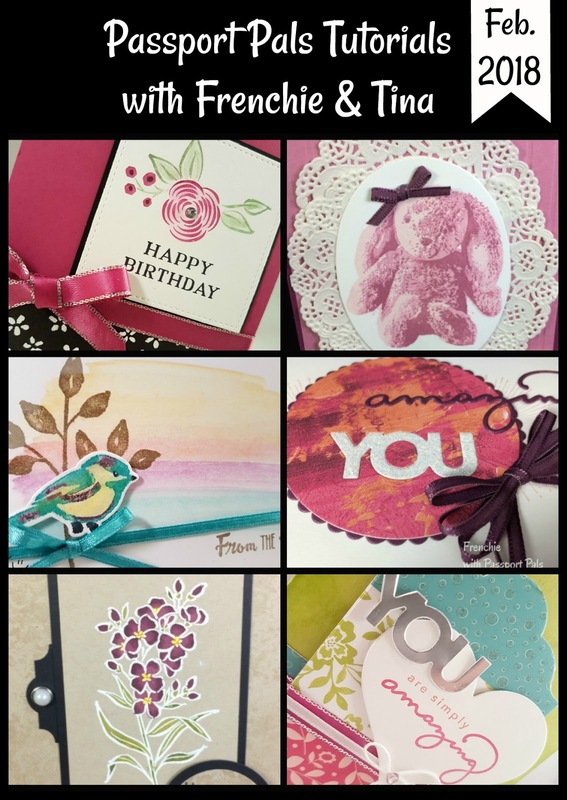 $250 savings in your pocket from now until March 31st!